BETTER: Thanksgiving | Frankly, My Dear . . . 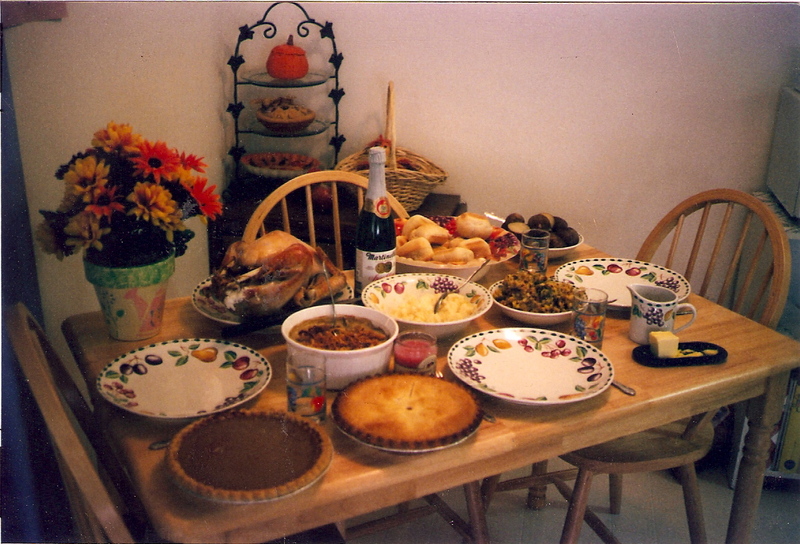 This is a photo of the first Thanksgiving dinner I ever hosted. It was my first “on my own” holiday. After not completing college and living at home until Dot was nearly four years old, it was time to move out. It was tough. I was working full-time and being a single parent of a young child had its moments. I often felt like I was failing. The budget rarely balanced. The apartment wasn’t always clean. Isn’t that what people say? “We may be poor, but we’re rich in love.” That was, and continues to be, true. I wanted to show off my home skills. And since my brothers couldn’t make it to town for the Big Feast, I let Mom know I wanted to host it. I didn’t know how I’d manage to afford all this food. I wasn’t sure my time management skills were up to the task. But I prayed. A lot. Alot-alot-alot. And through His blessings and the generosity of others, not to mention several found pennies (and then some! ), this entire feast cost me only $0.76. That’s not a typo. Mom provided two side dishes and dessert. I managed to barter, coupon shop, and was gifted nearly everything else. But I wanted a candle. Hence the seventy-six cents. I keep a copy of this photo on my refrigerator. Every time I go into my kitchen and wonder what I will eat, or what I’ll feed Dot, I see this photo. And I’m reminded that He feeds even the smallest sparrows. Sometimes I don’t feel like cooking. Sometimes I don’t think I have enough to cook. You know what? It doesn’t matter. We’ve never gone hungry. The reason I’m writing this post in March instead of November, is because I recently turned from mourning to dancing. I began to write again. I began to pray differently. I began to trust again. I began to trust Him again. And I began to thank Him. This past month I started to reorganize my writing. The To-Do’s, the location, the means, the ends. I have a game plan and outlines. Can you imagine my surprise when I found the feast photo amidst my notes? Especially since the refrigerator copy is still on the refrigerator! How did this extra copy find its way from some unknown storage into the few papers that are held in my new desk drawer? I don’t know. I honestly don’t know. I vaguely remember having a second copy tucked into an unused older Bible. But that Bible has been boxed away for years. And this photo reappeared just when I rediscovered my Writing Muse. 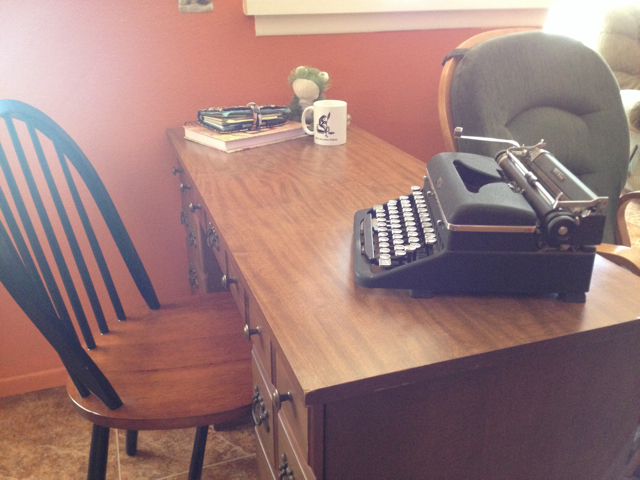 So there’s an intimidating sense of obligation to keep writing. A sense of, “Atta girl!” and “I’m pullin’ for ya!” A definite sense of “Yes, you can do it!” And a huge sense that I’m doing the right thing. I don’t think Thanksgiving should be relegated to one day or even one month. Thanksgiving isn’t an event. It’s a way of life. It’s the chance to stand up and let the world know you’re glad to be alive. And I’m definitely glad to be alive. Glad to have the life I have. Glad to be encouraged as a Mom. A daughter. A cook. A writer. And yes, a Christian. Glad to know I’m not as alone as I sometimes feel. There’s sense of security when you know your Daddy is there, taking care of you. You might not see Him behind you, but He’s there. You might not hear Him whispering to those around you, but He’s speaking through you. You might not even realize His presence. That’s okay. He’s still there. And because He is, I am. And I’m just so very thankful. Peculiar to say the least… but perhaps that photo showing up is the sort of thing that shouldn’t be questioned, merely accepted. I agree with you there, William. The feast looks delicious. I am glad you came across the photo and that it brought you to a great place. Reminders are all around us it seems, and some days I need to see them,and this one made me smile. Yesterday I was having a bad day, and while have a cup of tea waiting for my jury duty to start I saw a group of souls who had to come to the diner to clean themselves, and that reminder was jarring. My day was really much better after praying for them and giving thanks. Thanks for that reminder too, Winnie. You always have such a beautiful outlook.